When I think of Mariano I will remember his postseason brilliance which included 42 saves, an 8-1 record and an ERA of 0.70. I will remember him setting the MLB career saves record during the 2011 season. I will remember how he returned from an ACL tear at the age of 43 and went on to save 44 games during the final year of his Hall of Fame career. But most of all, I will remember how secure every Yankee lead seemed to be at the end of the eighth inning for almost two straight decades and how comforting it was as a Yankee fan to see that bullpen door swing open and see number 42 trot in to that elevated circular spot in the middle of the infield from where he performed his magic. 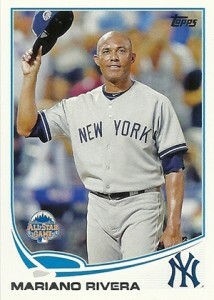 Thank you Mariano Rivera. Yankee fans will never ever forget just how magnificent you were. This former Yankee outfielder, this former Yankee DH and this one-time Yankee phee-nom share Rivera’s November 29th birthday. Thanks for sharing that great memory, Paul and thanks for your kind comment about my blog.